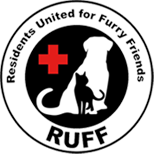 The mission of Residents United for Furry Friends (RUFF) is to preserve the health, safety, and integrity of domestic animals, including dogs and cats. Our nonprofit organization will accomplish this mission by providing development within the Warren, Rhode Island, community. This will consist of obtaining and providing funding for the betterment of animals in Rhode Island within the meaning of Section 501(c)(3) of the Internal Revenue Code or the corresponding sections of any future federal tax code. All efforts are done for the benefit of the above-categorized animals and the citizens of the State of Rhode Island and of the United States. In performing its mission, Residents United For Furry Friends, Inc. serves as a community resource to other citizens groups with similar concerns.